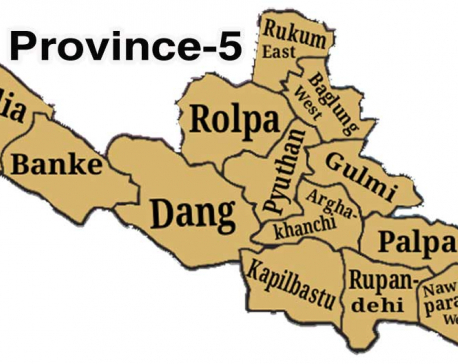 BUTWAL, Nov 13: Three months ago, a special committee was formed to recommend the name of Province 5 and its capital, but the deadline for the job expired with the committee doing nothing. For the past three months, the provincial cabinet has remained mum on the issue. In fact, various other offices which are known as 'mini cabinets' too are doing nothing. The committee could not make any recommendation even in such a long time. A 15-member committee was formed on August 10 after the continuous pressure from the ruling party members to declare the capital and name of the province. The committee was expected to recommend the name of the province and its capital by holding discussions and studying the diversity of all 12 districts of the province. Sadly, the committee is struggling to choose its coordinator. The delay in picking the coordinator is the result of differences in opinion between the leaders and lawmakers to pick Dang or Butwal as the permanent capital of the province. The committee called its meeting only twice in 90 days. The first meeting chaired by senior member Saraswoti Gautam ended with the members of the committee introducing themselves to each other. The issue of choosing the coordinator was floated in the second meeting. However, the discussions went nowhere after the Speaker of the provincial assembly tried to interfere with the decision-making directly. According to a member of the committee, Speaker Purna Bahadur Gharti was adamant on picking a coordinator of his choice. He apparently wanted Dipendra Kumar Pun, a lawmaker from Rolpa, to be the coordinator. Some members of the committee said that they have not been able to pick their coordinator and forward other processes because of the vested interest of the Speaker and the chief minister. As promised during the election campaigns, the leaders of Nepal Communist Party (NCP) and Nepali Congress (NC) are still lobbying for declaring either Butwal or Dang as the permanent capital. The idea of making Kapilvastu the provincial capital has been floated of late. However, there is less controversy over a name for the province. Most leaders are willing to name the province Lumbini, given that it is the birthplace of Gautam Buddha.